Home solar systems are beautiful. Just ask anyone who has one. Modern, sleek, and efficient, they signal a shimmering, rebellious independence and--as anyone who’s crunched the numbers knows--home solar makes financial sense. “Our market these days is 100 percent economically driven decision-makers,” said Marc Cléjan, the founder and chief executive of Southampton-based GreenLogic, the East End’s largest solar installer. The boom in rooftop solar across the globe has led to more competition, innovation, and lower equipment and installation costs, all of which are driving the smart money to home-solar electric generation. “The math just works,” Cléjan said of comparing the choice to remain on utility power versus switching to the sun. 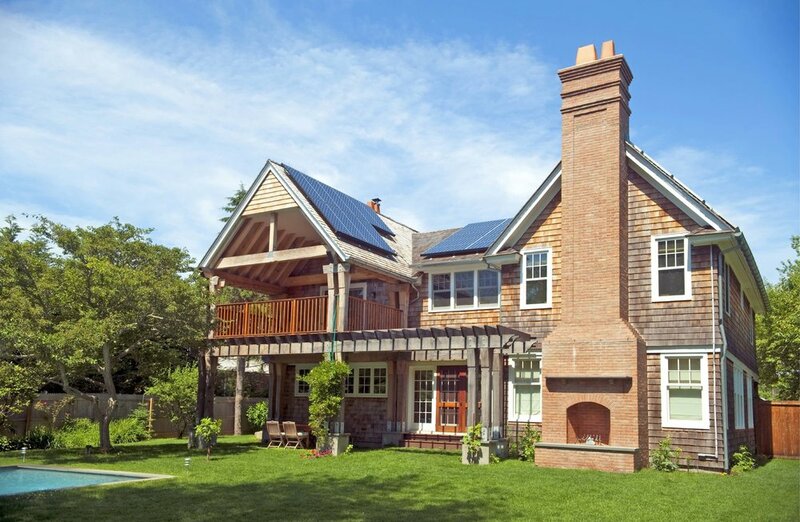 In Amagansett, a net-zero home that produces more energy than it uses during the daytime sending energy back to the grid. When the sun's not shining, grid-tied net-zero structures draw energy back from the grid. Photo courtesy of Green Logic. American solar installations reached a record high in 2015, making solar energy the biggest source of new electricity generation last year. Although wind is the fastest-growing sustainable power source worldwide, in the United States it is solar, which has benefitted from tax credits and rebate programs. Home system costs have dropped by an average of five percent in 2015 alone, according to industry experts. Meanwhile, entrepreneurs and designers are scouring the market for ways to attract consumers with cheaper, better ways to save, building more handsome systems, and finding nifty approaches like batteries to be more fully energy independent. This spring, Tesla rolled out a sleek, handsome Solar Roof that both converts the sun’s energy into electricity and serves as a roof tile. Combined with Tesla’s new compact Powerwall battery unit, the complete Tesla roof-and-battery system enables homeowners to juice their batteries by day and tap them when needed, during periods when the sun is not shining or in the event of an outage. In a typically slick marketing campaign Tesla is banking on its stunning, compact, efficient designs. But the jury is still out. Tesla, Elon Musk’s company that also manufactures automobiles and has a showroom in East Hampton, is entering into a crowded and competitive market of rooftop systems and in-home battery backups. The cost of an installed Tesla Solar Roof is reportedly higher than the combined cost of installing a conventional roof and building a standard rooftop solar system. And several companies already offer discreet, sleek low-profile panels, challenging Tesla on style. As for Tesla’s costly batteries, their main competitors are other battery-makers and fuel-powered generators—but mostly the electric grid itself. Under advantageous net-metering deals, homeowners with home-solar systems for the most part choose to remain connected to utilities like Long Island’s PSEG, essentially using the utility as a battery backup, for an annual hookup charge of about $12 per month. A Tesla Solar Roof. These shingles are embedded with photovoltaic solar cells. Renderings courtesy of Tesla. Some four percent — or more than 22,000 homes and businesses — of PSEG’s Long Island customers have rooftop solar systems, compared with one percent statewide, and that figure is expected to double in five years, PSEG’s director of energy efficiency and renewables, Mike Voltz, said in a recent interview. Although PSEG doesn’t have numbers for the East End, Green Logic’s Cléjan said his company has installed more than 3,000 systems, and business this summer has continued to be strong. Spurred by the success of GreenLogic and the growing appetite for smart, sustainable homes (with no recurring oil, electric, or other energy costs), Cléjan launched a company two years ago to build net-zero modern homes: houses whose electric and heating needs are met entirely from sustainable sources, including solar and geothermal technologies. We’re not talking tiny, hippy houses, but architecturally modern, beautiful, spacious, comfortable homes with smart, fully automated systems. ModernNetZero, as the company is called, has sold three such houses so far, all of them in East Hampton, and three more are in the works. Everything to do with home-generated power and the electric grid is in furious and dynamic evolution and transition. Some financial incentives are ending: local utilities have stopped offering rebates, the Trump appears to be less inclined to encourage solar, and federal tax incentives are set to wind down starting in 2020. International trade disputes and the looming threat of Trump-driven protectionism could threaten the flow of cheap solar technology from Southeast Asia and China, the source of the least expensive solar equipment. Additionally, a major court case underway now in United States courts could end up protecting U.S. manufacturers and their more expensive products. So when it comes to the overall cost to consumers, it’s anyone’s guess, but there seems to be a leveling off after years of steady declines. Yet most in the industry believe rooftop solar systems will continue to make economic sense for houses and businesses for the foreseeable future. A $5,500 Tesla Powerwall 2 rechargeable battery designed to enable self-consumption of solar power. Photo courtesy of Tesla. A big unknown, however, is the electric grid itself: How big will it have to be, and how will it sustain itself financially? Almost all solar homes still depend on power companies and their power lines to soak up their excess electricity during sunny afternoons and deliver power at night. One of the big existential questions facing grid operators is how to allow homeowners to soak up cheap power from the sun and slash carbon emissions in the bargain without completely undermining the grid itself--and simultaneously raising electric bills and the risk of blackouts. “Over time,” PSEG’s Voltz said, “the old energy-distribution model is being replaced by a two-way model” of power coming from thousands of small sustainable-energy systems on the grid and also from a utility. For power companies, the cost of central power plants and transmission and distribution networks continues to increase while the costs of much more local solutions, like wind and solar, are decreasing. What do utilities do in the face of that growing disconnect? And can they move away from making money by selling power toward a model that pays them for creating value for customers and society? Among the challenging issues is net metering. Net metering is the ability of homeowners to sell sun-generated power to utility companies and buy it back at the same price when their rooftop systems are not producing. Net metering is also the key factor in making home solar economically viable, because net metering rates were set by state regulators to encourage a defection to solar. But the result has been that utilities have lost customers in droves and revenue in millions. It’s no wonder that utilities like PSEG want to un-sweeten net metering deals in the years ahead (in New York, for example, they are governed by state regulations set to expire in four years). Not only will net metering likely become less attractive to potential home-solar customers, but that $12-a-month connection fee to PSEG could go up, too, industry watchdogs agree, to help the utility pay to maintain and improve its complicated and costly grid. However, it's worth emphasizing that homeowners who sign up for solar now are protected from ever losing their net-metering deals in the future. PSEG itself is localizing its power generation and distribution. The company installed two new battery substations in East Hampton and Montauk this year to provide a power backup during peak demand in the summer and storage and distribution for locally generated solar and wind power all year long. The profound shift in the electric business is remaking the relationship between power companies and the public. Ever improving, solar-power technology offers huge advantages to consumers and has touched off a race to educate, innovate, and build. The industry is in constant flux, and yet, for the moment, the direction is definite: turn, now, to the sun. Biddle Duke owns and operates a media company in Vermont. He’s a writer and founding editor of The East Hampton Star’s EAST magazine. He lives in Springs.